The European Master’s Degree in Human Rights and Democratisation (E.MA) is a one-year, inter-university and inter-disciplinary postgraduate programme. 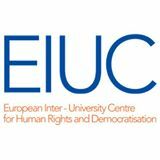 The programme aims at educating experts in the field of human rights and democratisation and to prepare them for their future work in international organisations, such as the EU, UN, OSCE and NGOs. During the first semester, which is taught in Venice, the students receive a comprehensive introduction into the historical, philosophical, anthropological, political and legal fundamentals of international human rights. At the end of the first semester, the BIM organises a field trip to Kosovo. The students spend the summer semester in one of the participating universities all over the EU, where they take part in seminars and write their master thesis. Further information about the E.MA can be found here.